(Brazil Nuts) The towering Brazil nut tree was originally discovered growing in hard, well-drained land along the Amazon River in South America. The Brazil nut tree produces a large round or pear-shaped fruit with an outer skin, a hard outer shell, and a core containing twelve to twenty Brazil nuts. 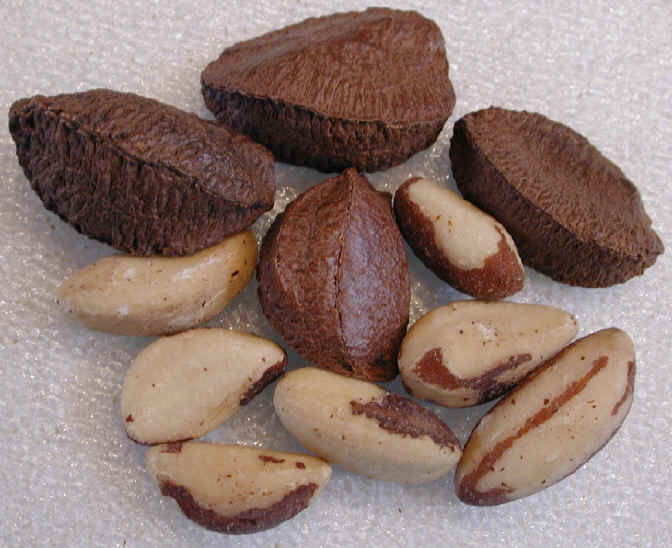 Brazil nuts are hard to crack open and to retain the whole nuts (as pictured), as the nut usually breaks up with the shell. We have found that the best way to open Brazil nuts is to place them in the freezer. When frozen, the nuts crack open easily, retaining the whole inner nut kernel. See nutritional chart below.